The Euro is headed for new lows over the coming months, according to analysts at UniCredit Bank, who say fears over the economic outlook mean things are likely to get worse for the single currency before they get better. 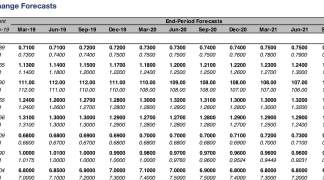 Many analysts are cutting their forecasts for Eurozone growth in 2019 and some are abandoning earlier predictions the European Central Bank (ECB) would lift its interest rate this summer, given that recent data has shown the economy slowing sharply during the second half of 2018. This knee-capped an already-beleaguered Euro in December, taking losses close to 5% for 2018, which is significant given how the Euro-to-Dollar rate had risen 4% during the first quarter. But the pain is not over yet. "With the central bank’s rhetoric likely to turn even more dovish at next week’s meeting and the possibility of ECB President Mario Draghi signaling that the Governing Council has entered reassessment mode regarding its rate guidance, we think a sustainable EUR-USD break above 1.15 remains unlikely in the near term," warns Kathrin Goretzki, a strategist at UniCredit. The Euro's appeal to to investors has been hinged on the ECB lifting its interest rates from record low and negative levels this year but the downturn in the economy means the inflation outlook may no longer support such a move by the time summer and year-end come around. Because of this uncertainty over the ECB outlook Goretzki and the UniCredit team say the chance of a breakout beneath the EUR/USD's 1.13 range low is higher than the odds of a break above the 1.15 range peak. The Eurozone's economic problems will not only keep the ECB on the sidelines though. They'll also prevent the safe-haven U.S. Dollar from weakening for a while yet, despite that the Federal Reserve has said that it is pausing its interest rate hiking cycle in order to observe developments in the global economy. That will ensure the bias of the Euro-to-Dollar rate remains to the downside over the short-term. "We believe the Fed’s hiking cycle has not ended yet, and rate differentials should become more USD supportive over the coming months. 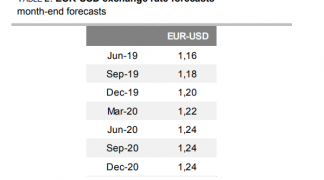 Consequently, EUR-USD is more likely to break below the lower end than above the upper end of its recent 1.13-1.15 range in the near future," Goretzki warns. 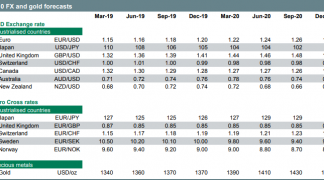 Goretzki forecasts the single currency will bottom out at 1.08 against the U.S. Dollar some time in June this year, marking its lowest level since early 2017, before recovering to 1.14 in time for year-end. Although the latter projection is contingent on UniCredit's view that the U.S. economy will also slow panning out. Above: EUR/USD shown at hourly intervals. The Euro-to-Dollar rate was quoted -0.29% lower at 1.1358 Friday and has declined by -0.81% thus far in 2019. Above: EUR/USD shown at daily intervals. CIBC's Rai has a more optimistic view than Goretzki and the UniCredit team. He says recent economioc data means the ECB will have to kick its interest rate can a bit further down the road but not by much, because a lot of the downturn in growth has been overstated in its importance for the rate outlook. 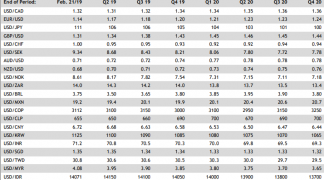 Germany's third-quarter economic contraction and likely-weak growth for the final quarter were largely the result of temporary disruption in the car manufacturing sector and concerns over the impact the U.S.-China trade war was having on the growth outlook. Rai says that for the ECB, signs that wages are now rising for Eurozone workers and inflation expectations are picking up will outweigh concerns over temporary economic weakness, leading it to pull the trigger on its first interest rate hike since the debt crisis. He forecasts that this will push the Euro-to-Dollar rate up to 1.22 by year-end. "While the ECB may delay policy action we do not expect this to materially compromise EUR performance," Rai says. "The prospect of rising wages supporting consumption and prices will ultimately provide an impetus for the start of a cautious tightening cycle."